What does an ‘infomercial’ have in common with a ‘motel’? Or a ‘workaholic’ with a ‘paratrooper’? Each of these words is coined by fusing two words together. Portmanteaux, as these blend words are called, are a bringing together of two or more words. Sometimes the union is perfect (motor + hotel = motel). At other times, it’s more like a shotgun marriage, as in today’s word, voluntourism. What portmanteaux have you coined? Share them below or email us at words@wordsmith.org. Many times a word is coined by two people independently -- make sure to google to see if the word you have coined already exists. noun: Tourism in which travelers do volunteer work. A blend of volunteer + tourism. Earliest documented use: 1991. Many years ago, fresh out of college, I was traveling for a job interview and started chatting with an old man sitting next to me on the train. Somehow the discussion went to volunteer work and when I claimed that sometimes I do selfless work, he said, “Well, son, everything I do is for myself.” Years later, I realized the truth of his words. 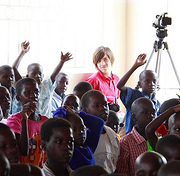 While voluntourism may be well-intentioned, it may not always be the best way to help. See here and here, for example. Consider volunteering with specialized organizations such as Doctors Without Borders, Translators without Borders, Engineers Without Borders, etc. or donating to them. Tim Lott; Under the Same Stars; Simon & Schuster; 2012.